All transactions are safe and secure with a reliable history in online purchasing behind each of our associates. 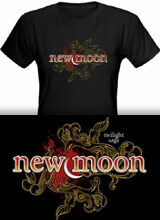 Buy the New Moon Logo t-shirt to own New Moon clothing and merchandise. In Stephenie Meyer's Twilight books Jasper is the husband of Alice and the adopted son of Carlisle and Esme. Before being adopted by the Cullens, Jasper was a high ranking member of the Confederate States Army during the Civil War. In the New Moon movie, Jasper attacks Bella after she gets a paper cut, prompting the Cullen family to flee Forks in order to protect Bella. This attractive New Moon t-shirt displays a stylish filigree style logo for the vampire movie. Wear it with a Rosalie pendant necklace for an alluring vampire New Moon merchandise combination. In addition to the New Moon Logo tee above, browse the New Moon Clothing Gallery for more apparel like men's and women's clothes, kids shirts or hoodies.